Pravrajika Vivekaprana, a senior sannyasini of Sri Sarada Math and the Ramakrishna Sarada Mission, came to America in the fall of 2016 to inaugurate celebrations for the 150th birth anniversary of Sister Nivedita. 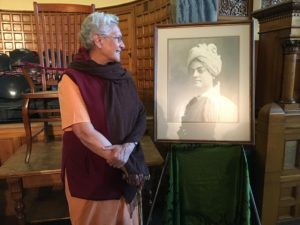 During her stay on the West Coast, Vivekaprana Mataji spoke at the historic First Unitarian Church of Oakland on Saturday, September 24, 2016, in Hamilton Hall, the sanctuary of the church in which Swami Vivekananda himself had spoken. Swamiji gave several talks here between February 28 and April 2, 1900. These included The Resemblance Between Vedanta and Christianity, The Laws of Life and Death, The Reality and the Shadow, The Way to Salvation, Manners and Customs of India, Arts and Sciences of India, and The Ideals of India. Swamiji would have used this same entrance in 1900. Swamji came to America and gave the very ultimate level of human evolution: that non-dual psychology that every human being is Divine. “We are not ready to accept that there is something deeply spiritual about me, some Beauty, something tremendously wonderful that will give me Joy. This was the idea Swamiji wanted to give to humanity.” He chose Sister Nivedita to help him with the work of educating girls. “Society gets nurtured through women. Unless women all over the earth reclaim that position, civilization will die.” A video of Pravrajika Vivekaprana’s complete talk can be viewed at http://www.maasamiti.org. 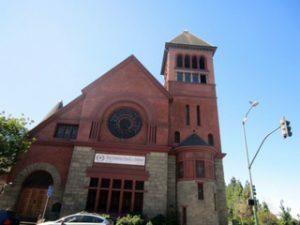 The First Unitarian Church of Oakland remains a significant cultural and architectural treasure in America. It is listed as a California Historical Landmark and is included on the National Register of Historic Places. The building site was purchased in 1888 and construction of this solid masonry Romanesque Revival style church was completed in September 1891. With the exception of the famous stained glass windows, only materials from California were used in the original construction. 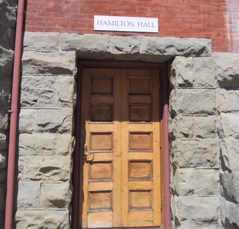 The dramatic redwood arches in Hamilton Hall were built of first growth redwood harvested from the Oakland/Berkeley hills. At that time, these redwood arches formed the widest span in any building west of the Mississippi River. 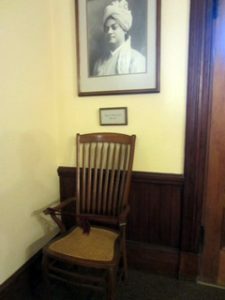 The chair in which Swami Vivekananda sat is preserved at the entrance of Hamilton Hall, with Swamiji’s picture overhead. A brass plaque in his memory adorns the Hall’s podium as well. Pravrajika Vivekaprana spoke in this historical setting a little more than a century later, before a gathering of over 125 people. God is one’s very own. It is the eternal relationship. He is everyone’s own. One realizes him in proportion to the intensity of one’s feelings for him.